This week I’m pulling heroes from three of the books on the New York Times YA bestseller list. 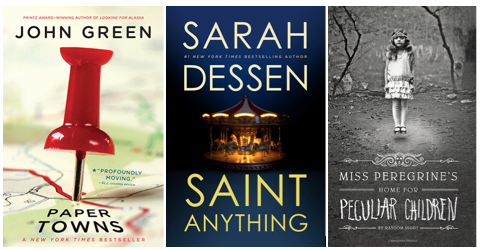 We’ve got Quentin from Paper Towns, by John Green, Mac from Saint Anything, by Sarah Dessen, and Jacob from Miss Peregrine’s Home for Peculiar Children. Let me know in the comments which character you would marry, who you would date, and who you would dump. Bonus points for interesting reasons why! Marry: Mac (I’m a sucker for pretty much EVERY Sarah Dessen romantic lead and Mac is no exception). Date: Quentin (definitely after the book ends and he’s learned all those lessons about not putting people on a pedestal). Dump: Jacob (this is only by default. There is definitely nothing wrong with this character!). This entry was posted in Marry Date or Dump and tagged books, John Green, Miss Peregrine's Home for Peculiar Children, Paper Towns, Ransom Riggs, Saint Anything, Sarah Dessen, YA by Alison Doherty. Bookmark the permalink. These memes are so cute! Do you host this and Wordless Wednesday, or just have a tab for them? Either way, I’m following you now via feedly. Thanks! I came up with both of them (or at least I came up with the idea of doing them on the blog myself, I’m sure there are other wordless wednesdays on blogs out there and marry date or dump is a game I certainly didn’t invent). I’m glad you like them!